Contact us to Discuss How DiSC Can Help You Drive Measurable Results In Performance By Learning How To Communicate More Effectively With Your Co-workers / Customers or For A Sample Report. Strategic Dynamics is an Authorized Partner for Everything DiSC, A Wiley Brand. Everything DiSC is the most trusted behavioral profiling instrument in the industry used by millions of training and coaching professionals across the globe. The tool identifies behavioral style by measuring the attributes, preferences and aspects of the respondent’s personality. 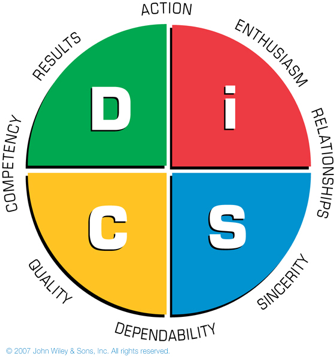 Everything DiSC is used to build stronger relationships, improve communication and ultimately to increase the performance of individuals, teams, and organizations. Everything DiSC identifies four primary dimensions of behavior – Dominance – influence – Steadiness – Consciousness. Everyone is a blend of 4 styles and has a unique behavioral style. An individual’s DiSC style is shown by a ‘dot’ which is placed on the model. DiSC styles do not identify abilities or strengths. There is no right or wrong /pass or fail. A style demonstrates priorities or behavioral style. An understanding of your own behavioral tendencies and the knowledge of how to adapt your behavior, to develop better relationships, improve communication, reduce conflict, create win-win solutions and deliver results. This profile can be used with everyone in any organization, regardless of his or her title or role. It is often used to build more effective relationships and improve the quality, effectiveness and performance in the workplace. Everything DiSC Sales helps sales professionals communicate more effectively with prospects and customers, management and support personnel. This profile gives the sales representative an increased awareness of their own selling style and develops their ability to understand the needs and priorities of their customers. This profile helps the individual to build strong sales relationships, connect effectively and naturally with their customers and improve communication. This will increase sales performance for the individual and organization. Everything DiSC Management Teaches Managers How To Bring Out The Best In Each Employee. This profile gives the manager specific behavioral feedback which can be used to understand and develop their personal management style and behavior to each individual. The profile is often used for management development and is focused on supporting managers to build effective relationships with their direct reports. The profile approaches management as a one-to-one relationship. Work of Leaders provides a simple, three step process to help you reflect on how you approach the fundamental work of leaders: Creating a Vision, Building Alignment Around that Vision, and Championing Execution of the Vision. This profile helps leaders get real results. The profile improves self-awareness in key areas that will help you achieve better outcomes as a leader. It focuses on helping the leader take tangible steps when leading a group or organization towards their desired outcomes and goals. This profile is often used to develop leadership awareness and ability and approaches leadership as a one-to-many relationship. Everything DiSC 363® for Leaders combines the best of 360s with the simplicity and power of DiSC, plus three personalized strategies for improving leadership effectiveness. The result is a 360° experience that’s more productive and satisfying. First, it takes the sting out of 360 feedback. For many leaders, 360s can be a frustrating experience. Open-ended comments can be unfocused and unhelpful and can even derail the learning process. With the profiles exclusive selectable comments feature, CommentSmart, raters can give focused, balanced, constructive feedback—that the leader can actually use. Then, it was made easier to understand and use. Your team will discover how to curb destructive behaviors so that conflict can become more productive. This is not your average conflict resolution program. Everything DiSC Productive Conflict offers highly personalized content that helps learners increase self-awareness around conflict behaviors and effectively respond to conflict situations, which ultimately improves workplace results and relationships. Contact us to discuss how DiSC can help you drive measurable results in performance or for a sample report. To Learn More about the Assessments, call us today!